or end up in pain. and the goal true notion. A parable elucidating a pathway to inner and world peace consistent with the teachings of Jesus Christ is presented. Using universal princi­ples regarding natural turbulence as recently uncovered via the science of complexity, the piece shows how simple notions from modern science allow us to visualize the consequences of personal and collective ac­tions and how such ideas entice us, through reason and faith, to seek harmony and friendship in a condition typified by the hypotenuse of a right triangle. 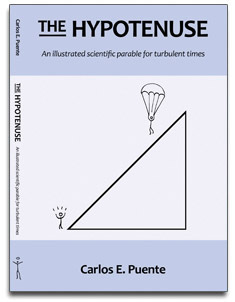 Written in a style that invites reflection and self-discovery, The Hypotenuse uses the format of an illustrated tale, with “people” walking on top of scientific diagrams, to weave concepts and symbols from mathematics, physics, politics, economics, and morals, in an original and unforeseen fashion. The work starts with a “geometric” citation from the gospel of Luke (Lk 3:4–6), followed by a preface and a Prelude that set the stage for the main text. The narra­tive is then divided into four main sections: a bit of history, a bit of math, a bit of physics, and a bit of common sense, which are supplemented by a set of notes, by the end of the book, containing pertinent references and additional explanations to the text. Then, the story includes a collection of poems-songs that further weaves the symbols in the para­ble, a postlude that emphasizes love as the solution to the evils we all face, and another Biblical quotation that reinforces the message of the parable, this time from the gospel of Matthew (Mt 19:16–24). See also the presentation The Hypotenuse: The Path to Peace. Those looking for a good song may also be interested in the music video for the song Y = X. — Rev. Wil Tyrrell, S.A.
— Vijay Kumar Gupta, Ph.D. and Indira Bhatt Gupta, M.S.W. Carlos is available to share presentations about his work on peace. Cover art by Fernando Duarte. Page design by Guillermo Jiménez and Segundo. HOME | RESEARCH | TEACHING | BOOKS | PEACE | SONGS | C.V.